A day after groups of ex-servicemen termed the government hike in pension for armed forces personnel as ‘misleading’, authorities in the Ministry of Defence (MoD) yesterday retorted by saying this was the third hike in pension in the past four years. A detailed chart of the financial benefits given to ex-servicemen since October 2008 is being calculated and will be released soon, said sources. “Our aim is to cover the gap in pensions in a phased manner. This is the third increase in pension of ex-servicemen after the Sixth Central Pay Commission award was announced in October 2008,” authoritative sources said. The Central Industrial Security Force (CISF), a leading government security agency that already multi-tasks on several fronts, will soon have a new job - protecting Indian merchant ships from pirates on the high seas. The force is training 200 of its men as armed guards on board privately owned Indian merchant ships carrying billions of dollars worth of goods. Initially, the men will be deployed on board government-owned vessels, said CISF officials. Close to 95 per cent of all the $791 billion worth of Indian imports and exports is through the sea route. This will be the new job for the CISF that is responsible for security of 59 airports in India. The force also provides on-payment services to six leading private companies like Infosys in Bangalore, Pune and Mysore, Jamnagar Oil Refinery, Electronic City in Bangalore and Delhi Metro Airport Express Line. Besides this, public sector giants like Steel Authority of India and ONGC also use the CISF. According to senior officers of the CISF, 100 men will be deployed on board the merchant ships and the rest will be kept as reserves. CISF officers said that the men chosen for the sea-faring task will be commandos. The training of these personnel is for a duration of three to four months and will begin in October. The Navy will be requested to train the men so that they gel in with the Indian doctrine at sea. The CISF personnel on board will be equipped with area weapons such as light machine guns (LMGs), AK-47s and INSAS (Indian Small Arms System), said a senior officer. “A group of four troops led by an officer will be part of the crew of a merchant ship. The officer will make the decision to fire upon a hostile vessel. But our mandate is just to guard our ships and not shoot to kill,” said an official. INSA will be coordinating with the CISF for the deployment of the men. INSA has 37 shipping companies as its members and will decide which companies will receive the first armed guards. Earlier, the shipping association had requested the Directorate General of Shipping to grant the approval of armed guards on board merchant vessels. DG Shipping approached the Union Home Ministry which thereafter assigned the CISF to do the job. Union Shipping Minister GK Vasan on September 3 in a reply to a question that was raised in the Lok Sabha said that 43 Indian seafarers are being held hostage by pirates. Fifteen of them have been held captive since 2010. India today rejected Pakistan President Asif Ali Zardari’s statement at the UN General Assembly (UNGA) that Jammu and Kashmir remained a symbol of failures rather than strengths of the UN system. 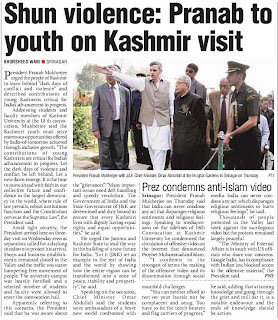 “We have seen the reference to Jammu and Kashmir in the statement of the President of Pakistan. You know, our principled position on the issue has been consistent and is well-known. The people of J&K, which is an integral part of India, have peacefully chosen their destiny in accordance with democratic practices and they continue to do so,” Foreign Secretary Ranjan Mathai said at a media briefing in New York on the margins of UNGA. 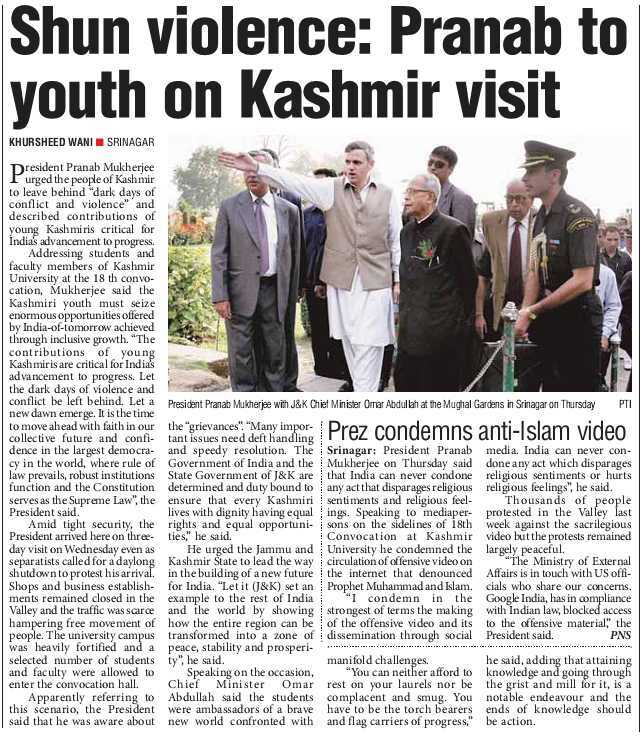 The text of his media interaction was made available here by the External Affairs Ministry. 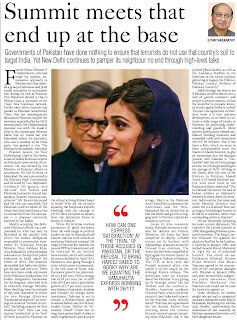 New Delhi seems disappointed with Zardari for raking up the Kashmir issue at a time when the two countries are making a steady progress in their dialogue process. 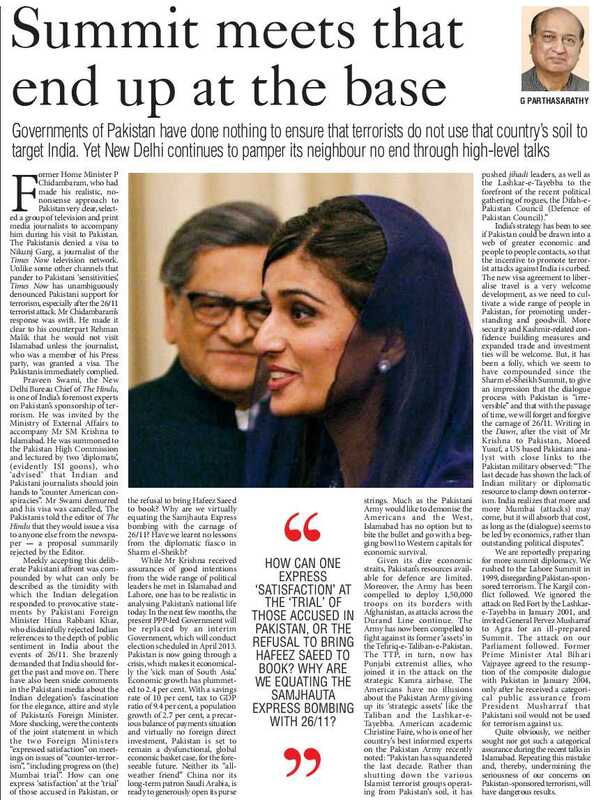 At the same time, it does understand the Pakistani leadership’s compulsion to keep the Kashmir issue alive lest people in the country start feeling that the issue has been out on the back burner. 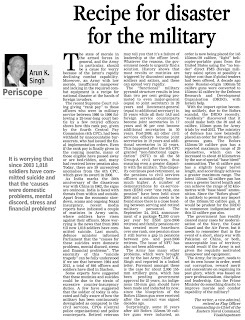 OF late the media, especially newspapers and social networks, have been full of articles on the armed forces and their “discontents”. Since the authors of most of these are retired generals, air marshals and, occasionally, admirals, they refer more to the complaints and disgruntlements of highest military officers rather than of Other Ranks. Yet rare is any writing on the subject that hasn’t lamented the government’s heartless and overlong failure to attend to the just demand of ex-servicemen for equal rank, equal pension, or OROP, for short. Over this period one has had to witness not just virulent agitation on the issue but also such heartrending scenes as the nation’s defenders marching to Rashtrapati Bhavan to return their gallantry medals to the Supreme Commander, the President. Thank God, this ordeal is now over. The government has at long last done justice to two and a half million ex-servicemen whose number increases by 70,000 every year. The key point is that these men retire an early age and have to exist on meager pensions while other retirees of the same rank get higher or lower pensions depending on their dates of retirement. A good proportion of the retirees could have been absorbed in the paramilitary forces, to great advantage both to them and the country. But this has not been possible, despite the best attempts of several defence ministers and others, because the monster of corruption has taken over the recruitment to not only the police forces in various states but also the Centre’s paramilitary organisations. Even the sleaziest of recruiters find it hard to ask retiring Army men for bribes, and so they are ineligible. Lest the Army should start assuming superior airs on this score, let me hasten to add that on the admission of the best and the brightest within its own higher ranks, corruption in recruitment has contaminated the Army, too. As for other form of graft and malfeasance in the uniformed world, the evidence is littered across the country’s law courts or is stacked on the desks of the Central Bureau of Investigation. On the merits of the government’s decision on OROP, there are two views. Some say that having gone thus far, the government could have gone a little farther and met the demand for one-rank-one-pension in full. They argue that this would not have added very much to the present package of Rs 2,300 crore which is a pittance compared with Rs 42,000 crore the government has generously offered the State Electricity Boards than which it is difficult to think of institutions more inefficient and corrupt. Having bankrupted themselves, they have run into debts amounting to the staggering figure of nearly Rs 2 lakh crore. The debt recasting, even if it is achieved — the states have yet to agree to bear half the burden — would not solve the problem. For, no chief minister would stop the overuse and misuse of free power guaranteed to the farmers. Moreover, nobody would dare say boo to the crooks with clout that are stealing a huge quantity of power with impunity. It is, of course, written off as part of “distribution and transmission losses”! Even so, there is a perfectly valid counter-argument to justify what the government has done. It has, it seems, gone as far as it could have or should have. After all, the amount of pension depends not only on the rank but also the last pay drawn. The salaries of the two men of the same rank and superannuating on the same day often differ because of the length of service in the last rank reached. The Cabinet on Monday could have decided also on several issues concerning the pay, perks and pensions of lt-colonels, colonels, brigadiers and even lt-generals that have also been pending. But evidently, the committee headed by the Cabinet Secretary that examined the entire issue has not been able to complete its recommendations on these points. What the government has got out of the way is very important, no doubt, but it was essentially a sideshow. 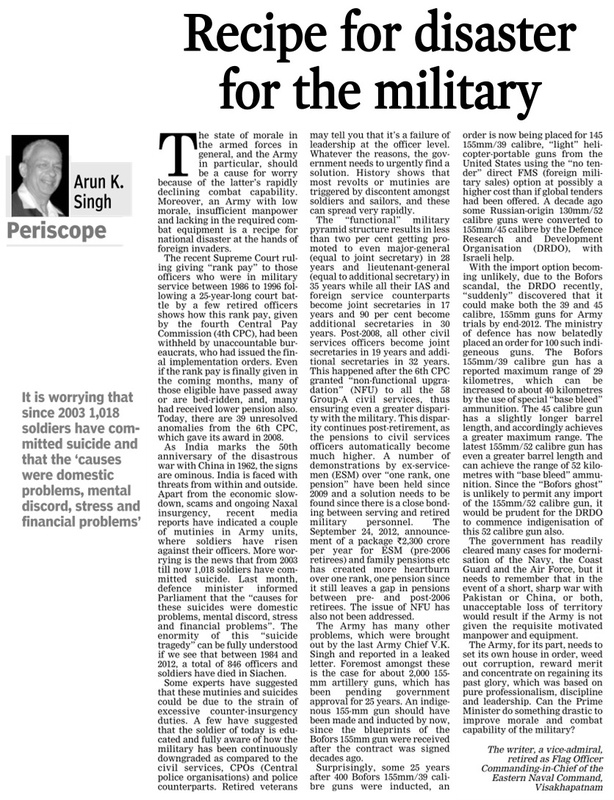 The real problem, on which the armed forces’ resentment is perfectly legitimate, is the composition of the successive Pay Commissions appointed to fix the salaries and concomitant allowances of both the civilians and the military. In other democracies there always is a separate pay commission for the armed forces. If this country is determined to deviate from this sound practice, why does it always make an IAS officer the commission’s secretary and usually excludes from it any representative of the three services? It is no secret that at the root of the bad blood in civilian-military relations is the services’ intense dislike of the IAS bureaucracy that, they feel, lords over them. Other discontents of the services are a subject too large and would have to be discussed separately. But on one point, I am afraid the Army top brass is unnecessarily touchy is its place on the Warrant of Precedent. Some industrious scholar has discovered that, in the American pecking order, the position of the chairman, joint chiefs of staff is much lower than that of the three service chiefs here on the WoP. There is no heartburning there on this score. Here, it seems, two-thirds of a century after the departure of the British amidst farewell trumpets, wearers of khaki are harking back to the era when, next only to the Viceroy, the Commander-in-Chief (India) was the second most important man. This is just not possible in a democracy where the wholesome principle of civilian control over the military (which need not mean civil service control) is well established. Who sits where around the President’s banquet table is immaterial. What matters is that, in the US, the Chairman of the Joint Chiefs of Staff, together with the Defence Secretary, the Secretary of State, National Security Adviser, and the head of the CIA, is among the President’s main advisers and a member of the National Command. This country remains allergic to the concept of a Chief of Defence Staff for several reasons, including regrettably, stiff resistance within the armed forces, and the departing conduct of the previous Army Chief, General (retired) V. K. Singh. NEW DELHI: With procurement of Tatra trucks put on hold, the defence ministry is facing problems in maintenance of over 7,000 of these vehicles in the armed forces and is likely to seek advice from the law ministry in this regard. The ministry is likely to seek the opinion of the law ministry on how it should go about the maintenance of Tatra trucks as supply of all-terrain vehicles from the UK-based company has been put on hold because of a CBI probe into alleged irregularities in their purchase, sources told . After getting the view of the law ministry, a final decision on the issue may be taken by the ministry's Defence Acquisition Council, they said here. The issue of maintenance of these trucks is a key area for the armed forces as high-value assets such as strategic missiles and other heavy weapon systems are based on these vehicles. After then Army Chief Gen V K Singh levelled bribery allegations in connection with procurement of Tatra trucks, defence minister A K Antony had ordered a CBI probe in the case. Procurement of trucks from Tatra were put on hold after that and CBI has questioned several officials including the head of Tatra Vectra in this regard. The defence ministry is also in the process of cancelling an order, placed after CBI began its probe, for one Tatra truck worth over Rs 50 lakh for meeting a DRDO requirement in May. The chairman of BEML, which was supplying these trucks in India in partnership with Tatra, has been suspended by the ministry for ensuring a free and fair probe into the charges. JAMMU: Army today foiled an infiltration bid along the LoC in Poonch sector, where one militant is believed to have been killed. A group of four-five armed militants tried to infiltrate into the Indian side of the border along LoC in Krishnagati forward area and their movement was picked by surveillance devices and troops guarding the border, an Army officer said. Troops guarding the borderline fired at the infiltrating militants, who fired back resulting in exchanges, he said. After the brief exchange of firing, militants tried to return, he said, adding that a body is lying close to the border line. Search operations have been launched in the area. LUCKNOW (PTI): Indian Army Chief Gen Bikram Singh on Wednesday visited the Central Command headquarters in Lucknow and reviewed operational preparedness of the force. Gen Bikram Singh, who arrived in Lucknow on Tuesday with his wife and President of Army Family Welfare Organisation (AFWO) Bubbles Singh for a two-day visit, was briefed by Lt Gen Anil Chait, General Officer Commanding-in-Chief, Central Command. The Army Chief addressed officers on challenges facing the army, collective efforts required in overcoming them and the need to carry forward the core values of sincerity, commitment and dedication to the organisation, a defence spokesman said. Gen Singh emphasised on the need to return to the basics of soldiering with emphasis on discipline and esprit de corps. In his interaction with ex-servicemen later, the Army Chief assured them of concerted efforts towards amelioration of their problems. Gen Singh made a courtesy call to Uttar Pradesh Chief Minister Akhilesh Yadav and thanked him for the support extended to ex-servicemen and army. Indian Army's lease of the Valley’s biggest meadow – Tosa Maidaan located in Badgam disctrict ends this December, and the residents of Khaag and adjoining localities in the district want removal of the Army’s firing range from the area. Tosa maidan was given to Indian Army on lease in 1962. The locals claim that artillery shells are fired from the banks of Sukhnag River near Chill village towards Tosa Maidan. CHANDIGARH: Indian Army will soon have an oxygen room on top of the world to acclimatize troops to the high altitude conditions. Till now, soldiers used to take almost a week to adapt to the conditions in Siachen and Leh. Now onwards, rushing troops to an altitude of 11,000 feet and putting them into action will take just 2-3 hours with the help of the oxygen room. The DRDO has developed the oxygen-enriched room for rapid induction of the soldiers who had to wait for a week for adaptation before they could venture out on duty in Siachen and other very high altitude areas. The DRDO has set up one such room at Leh and six more such facilities will come up in forward areas, including Siachen, soon. W Selvamurthy, chief controller of research and development at DRDO, who had been at Leh recently to make the troops aware of the functioning of the facility, said, "In a Kargil-like situation the Army is not given any time to adapt to the high altitude. The troops who are vulnerable to acute mountain sickness and get breathless suffer a lot during these emergencies. We will create six such rooms in the base camps of all the forward areas." The room has been designed by Defence Institute of Physiology & Allied Sciences (DIPAS), a DRDO lab in Delhi. "This room is for rapid induction of the troops to the high altitude. The percentage of oxygen does not decrease in high altitude, it is the reduction in the partial pressure which makes one feel breathless as there is decrease in availability of oxygen to the body cells at such a height," said Dr Shashi Bala Singh, director of DIPAS. However, cautioning that the room is only for emergency situations where there is less time for the soldiers to adapt, Shashi said, "The body has a natural capability of adjusting to a height up to 2500m. We recommend this room only in emergency situations. This is also for the VIPs who fly in for a day and leave immediately."